Micellar waters are the crème-de-la-crème of French Pharmacy products, the innovation that introduced most of us to the remarkable world of French Pharmacy skincare. You’ll often see bottles of micellar water adorning the work stations of make-up artists and behind the scenes of fashion shows as it’s just unbeatable for its quick and effortless make-up removing properties (even on waterproof mascara), plus it’s ace to have on hand to correct any make-up mishaps… we’ve all got a bit carried away with eyeliner a time or two! A lot of beauty bloggers and regular folk will testify that once you’ve introduced a micellar water into your cleansing regime, you’ll never look back thanks to their easy and effective nature and guilt-free results. So what makes these waters so indispensable? Is it their no-rinse solutions, unfussy nature or just the hype? And what exactly is in these little bottles of wonder anyway? To help you fight your way through the oft-confusing world of the micellar I’ve popped together a little myth-busting guide for you! So what exactly are micellar waters? Contrary to popular myth, micellar waters are not just expensive bottles of water. There’s a lot of science behind them, with tiny little molecules whizzing about unseen to the naked eye inside the bottle! They were originally formulated in the early 90s to help Parisian women deal with the notoriously harsh water that wasn’t so great for skin. The science bit: micellar waters contain lots of teeny tiny molecules called micelles (aka, spherical liquid crystals) which form spontaneously into surfactants (the stuff that cleans the skin) when introduced to the right kind of molecules in water. Surfactants are found in lots of cleaning and cleansing products, but not all surfactants are created equal. It’s the quality of the surfactants within micellar waters that make these ultra-gentle waters a world away from soap-based cleansers. They’re mild enough to be left on the skin without causing irritation, giving way to the no-rinse formula that’s so handy when in a pinch. Plus, as they cleanse skin so delicately without stripping the skin, they’re a great choice for those with skin of a sensitive nature as even the most troublesome complexions are left soft, nourished and hydrated. It’s these minute micelle-surfactants that perform the remarkable cleansing action associated with micellar waters. Under a microscope these micelles look kind of like a balloon with a big round head and a zig-zag tail. The round micelle head prefers water and hates oil, grease and make-up whereas the tails love it, so when they’re dumped into water together as they are in micellar waters the tails will all gather together, holding on to each other whilst the big round heads all gather around the tails to form a sort of circular shield, thus forming a micelle molecule! But, when we apply the micellar water to a cotton pad, the big round water-loving micelle heads are attracted to the cotton as it’s hydrophilic (a coating that attracts water), so they dive head first onto the pad and leave the oil and make-up loving tails sticking up ready to trap all the nasties from your skin! That’s why when we swipe a cotton pad soaked in micellar water across our face make-up and dirt is drawn out and captured by the oil-loving tails, which are ready and waiting to go. They latch on to any oils, grabbing it with their tails and transferring them onto the cotton pad, kind of like a magnet. But as the little tails can only grab so much at one time, it’s likely that you’ll need to go over your face a few times to ensure you’ve removed everything. What kind of Micellar Water is right for you? With each brand producing their own micellar water with different properties and for specific skin types, it can be really tricky to figure out which one’s right for you. I’ve broken it down below by skin types to clear up any confusion! This one’s pretty easy, as almost all micellar waters have been formulated to be extra gentle, thus making them suitable for sensitive skin types. The cult no-rinse Bioderma Sensibo H20 with its ultra-mild alcohol-free formula will gently cleanse skin of all traces of make-up. Created with individuals who experience redness and skin irritation in mind, the added decongesting ingredients to improve skin tone. This water is fragrance and alcohol-free with a physiological PH and a soap-free base that makes it great for all skin types. Plus, there’s 1 bottle sold on average every 3 seconds around the world! 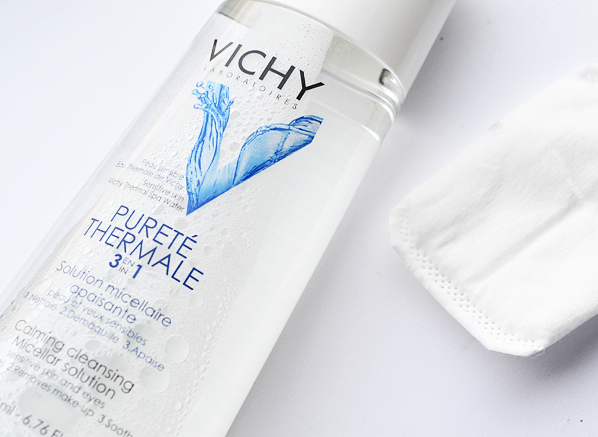 Another fantastic option for those with a sensitive complexion is the non-drying Vichy Purete Thermale Calming Cleansing Micellar Solution. This ultra-soothing water has been designed for those who suffer skin intolerance even from tap water, enriched with skin remedying Rose Phytopheno to cleanse in one simple step. An added dose of dermatologically-approved Vichy Thermal Water goes one step further to reduce skin reactivity and fortifies skin’s natural defensive barriers, which leaves skin with a cool, refreshed feel. 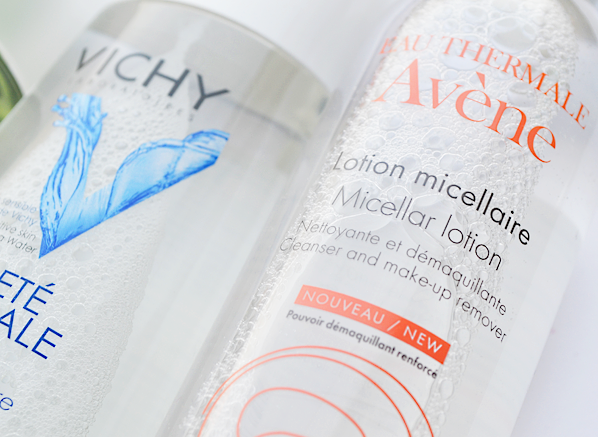 We can’t not mention the Avene Micellar Lotion in a sensitive skin micellar water round-up! Crafted with a high percentage of the infamous, soothing Avene Thermal Spring Water, this cleanser is ideal for complexions susceptible to repeated aggressions and reactive flare-ups, helping to pacify red, itchy and tight feeling skin, restoring its natural balance and suppleness. If you’re a sufferer of dry-skin with the occasional bit of redness then the extraordinarily gentle A-Derma Sensifluid Cleansing Micellar Water is the one for you. Especially created by specialist skincare experts A-Derma for those with dry, sensitive and eczema-prone skin to be ultra-soothing and caring without compromising it’s cleansing abilities. This water, formulated with the exclusive Rhealbea Oat Seedling Extract and Witch Hazel, delicately removes every last scrap of make-up in one single swipe whilst refreshing and comforting the skin. Brilliant stuff. The boffins over at Bioderma have also treated those with dry skin to the Hydrabio H20 Micelle Solution, a version of their beloved Sensibio H20 for those with dry, dehydrated skin. This blue-lidded version is a favourite amongst many beauty writers, including the Sunday Times Style beauty columnist India Knight, and has been formulated with an alcohol-free base and the patented Aquagenium Biological Complex that locks essential moisture on the surface of the skin. Not only that, it also stimulates the skin’s ability to retain moisture too, helping ot remain balanced and comfortable feeling with no sacrifice to its cleansing and decongesting abilities. 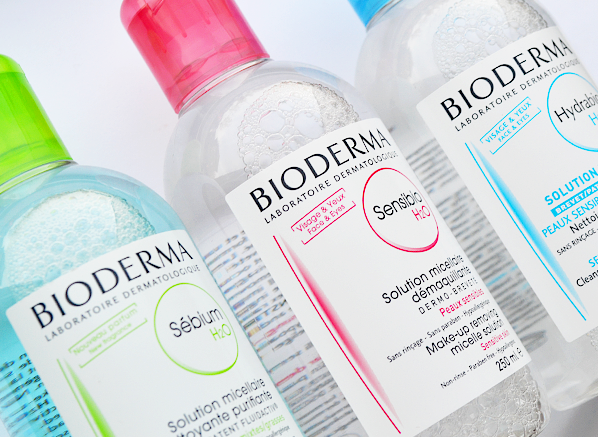 If you have an oilier, imperfection prone skin-type than the green lidded non-comedogenic Bioderma Sebium H20 micellar water could be just the thing for you as it works to improve the quality of skin’s natural sebum production its patented Fluidactiv Complex, whilst also providing the same exceptional cleansing capacity as the original Sensibo formulation. Then the soap-free Vichy Normaderm Micellar Solution is a great choice for you! Formulated with the usual micelle solution and infused with blemish-busting Zinc PCA it removes make-up, grime and grease from the face for a lovely fresh and clear complexion. There’s also the ultra-soothing Avene Cleanance Cleansing Water that’ll softly cleanse and purify the skin, whilst regulating sebum production and fighting blemishes. A marvellous pick for those with sensitive, imperfection prone skin as it’s really gentle and repairing. And lastly, if you’re a fan of the La Roche-Posay Effaclar Range then you’ll love the Effaclar Micellar Water, designed to both treat impurities and mattify the skin, so wonderful for oily-imperfection-prone skins. A finely balanced water that won’t dry out your complexion, but will banish those pesky blemishes! Those with a normal skin type are pretty lucky, as you’ll be able to get away with using the majority of micellar waters available, with exception for those designed for oily, imperfection prone skins as they’re likely to be too stripping. The NUXE Micellar Cleansing Water with Rose Petals is a floral rose-based water that is a pleasure to use and a great choice. This one-step, gentle cleansing formula has a delicate rose scent that is as moisturising as it is cleansing. The alcohol-free free fluid concentration of soothing Damascena rose petals, skin-calming allantoin, anti-oxidant Green Tea and ultra-nourishing coconut extracted micellar surfactants ensures it’s a hero cleanser for all skin types. 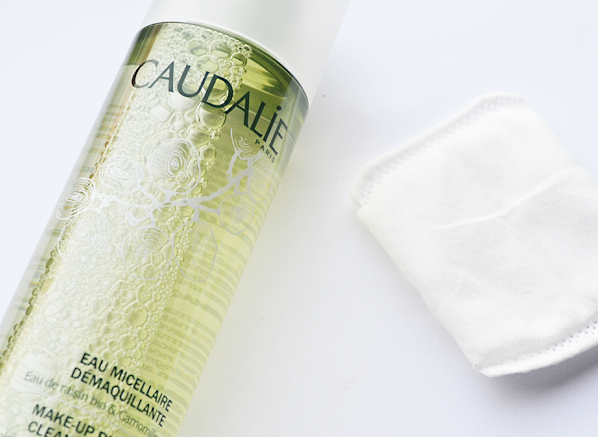 Alternatively, the Caudalie Cleansing Water is a fab option for those with normal skin. This super skin-friendly choice has been crafted with 97.5% natural ingredients, including ultra-moisturising organic grape water for a superior clean. The deliciously refreshing scent of citron blossom, orange blossom, watermelon and crushed mint only serves to enhance the cleansing process! Lastly in my micellar water round-up, we have the La Roche-Posay Physiological Micellar Solution which although formulated for those with sensitive, dehydrated skin works fantastically on all skin-types to leave a flawlessly clean, radiant complexion. Prepared with a physiological PH and agents specifically selected for optimal tolerance this solution is enriched with the famous La Roche-Posay Thermal Spring Water for maximum results. This is superb for those suffering from somewhat dull skin, seeking a softer, brighter skin-tone. And there we have it – the ever popular French Pharmacy Micellar Waters mythbusted! Remember, if you’ve got any questions about any of the above or need some recommendations, comment below or tweet me at @EscentualKay! First I think I should mention this contains silicones* (not something that's particularly bad but I think you should be aware if you're looking out for those sort of things) and you can feel it - it has a very slippy feel to it which actually means it glides across the skin quite nicely. I used it a few times for removing my make up before my proper cleanse - quite efficient at this (need about 3 cotton pads). Took my mascara off well too which is great but it's not a staple in my routine. Where is has come into its own is recently - I've got quite a bit of sore, itchy eczema on my face. I did not want to use my normal hot-cloth cleansing method on this area as the flannel/muslin really hurt my skin. I reached for this and it was quite a revelation - no stinging, thoroughly cleaned my skin (even removing the thick layer of ointment I have been putting over my eczema) and yet not leaving my skin tight or itchy immediately afterwards. *Escentual.com - perhaps it may be helpful for you to add an "ingredients" tab to each product? This entry was posted on Friday, October 31st, 2014 at 4:24 pm and is filed under French Pharmacy, Skincare, Skincare Edit, Tried & Tested. You can follow any responses to this entry through the RSS 2.0 feed. You can skip to the end and leave a response. Pinging is currently not allowed. I never wear make up. Are Micellar waters OK for just getting the day’s grime off or would I be wasting my money? That all depends on what you would like to achieve! If you reply with your skin type and your complexion’s main concern, we can pop you an efficient recommendation asap. Hi, I have oily skin which is fairly problem free, I only ever break out at that special time of the month however do get psoriasis around my nose if I don’t treat my face kindly. I’ve been using micellar water to remove make up but recently bought witch hazel to mix it up. Is one better than the other or are they much in the same?